PLEASE NOTE: The PDF book requires you to resize the pattern on a photocopier. Because of the variety of printers and settings, the PDF will print at different scales. To help with resizing the pattern, you will need to resize the squares so that they equal 1" for proper registration of pattern pieces. 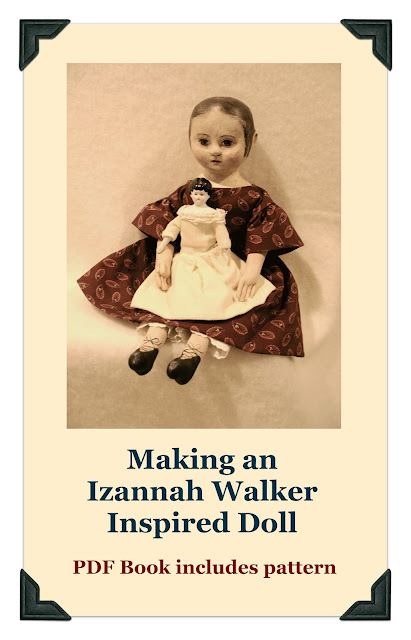 I've traveled thousands of miles in search of knowledge about Izannah Walker dolls. I've taken hundreds of pictures of original Izannah Walker dolls and shared on the Izannah Walker Chronicles while learning. about these wonderful dolls. I designed a pattern and led several sessions of an online class based on the information in this book. 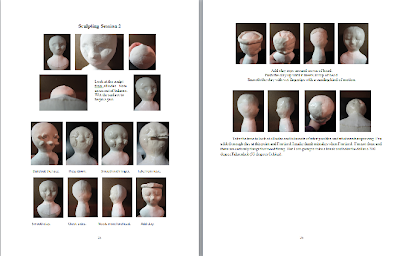 The pattern consists of making a cloth doll over which a one of a kind clay head is sculpted. 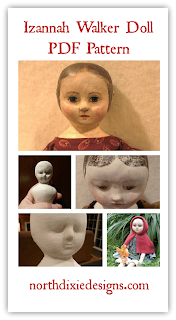 My pattern and the instructions are inspired by Izannah Walker dolls but use modern materials like paperclay. left comments about their experience here. What skill levels are required to make this doll? It is best if you have sewing and sculpting experience. 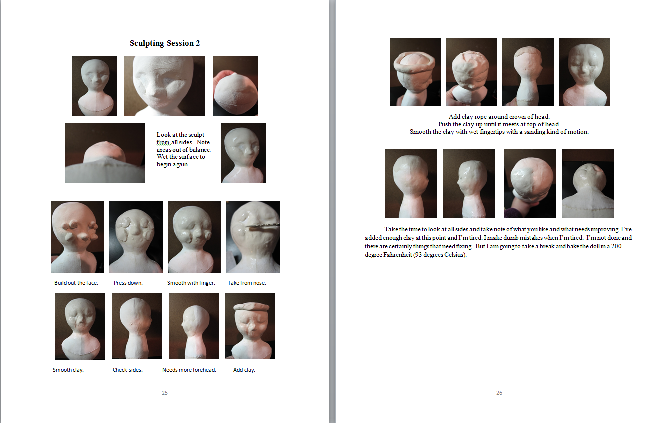 You will be sculpting your own Izannah Walker head using paperclay and looking at inspiration pictures I have provided. I suggest that people make 3 dolls at the beginning and give themselves permission for their first few dolls to be learning dolls. Some people did take the now retired Izannah Workshop who had never made a doll and their efforts resulted in some lovely creations. But sculpting and sewing experience makes it much easier. The book is in a PDF file, which can be viewed on your computer. You can also print a copy for your own personal use. To purchase the e-book, you will click on the "Add to Cart" button below. This will open a window which allows you to pay for the book through Paypal. Once you have paid for the book through Paypal it will open up a window with a link to download the book to your computer. I've tested this a couple of people and it went through fine. I am reducing the size of my doll study collection again. You will want to keep your eyes on posts here, as I will have other lovely creations to offer. I purchase dolls, enjoy them a while, and then send them on the next leg of their journeys. First to be available for purchase is this lovely 36" Fairchildren Doll, made by Helen Pringle. 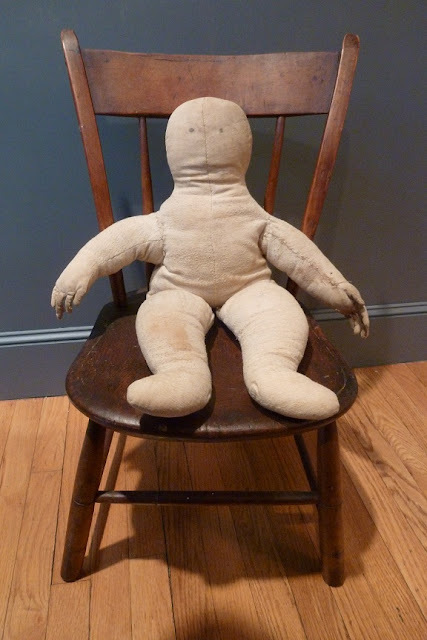 This doll is shown sitting in an antique child-sized chair. Chair is not included. 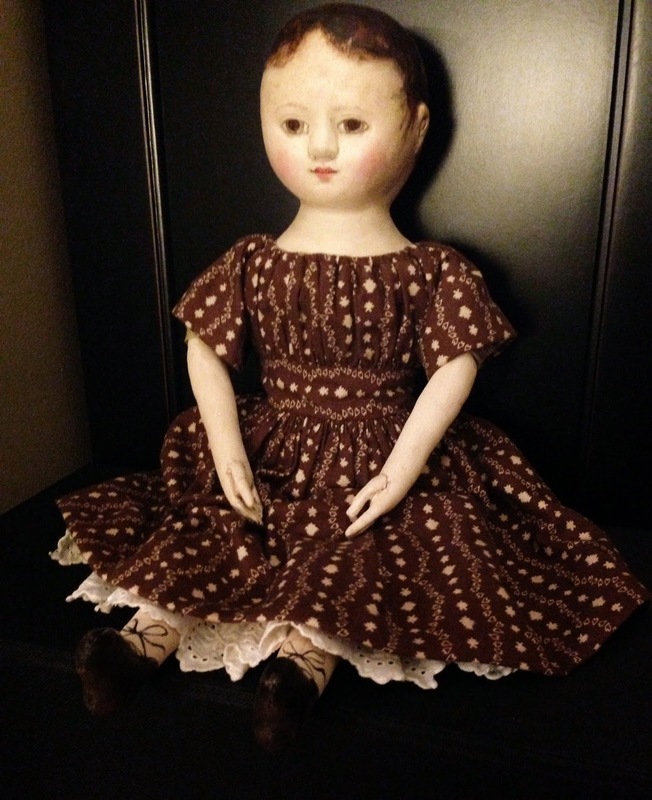 I purchased this doll a couple of years ago, and have enjoyed her presence in my home very much. 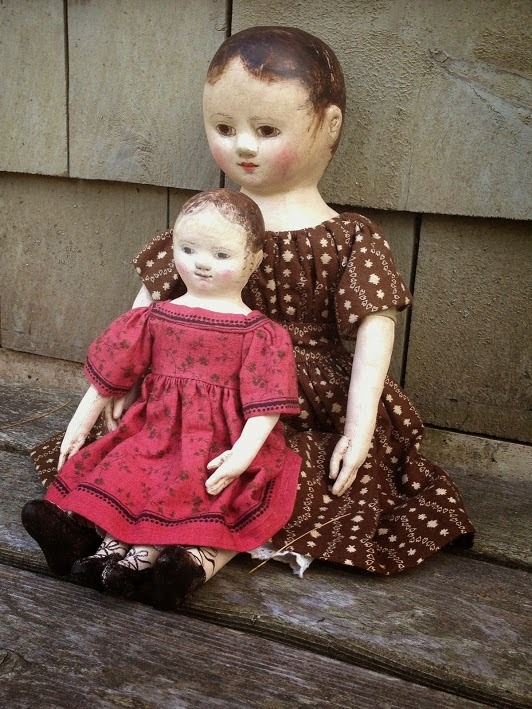 Helen's works have a lovely presence - evoking the feel of dolls made by 19th century doll makers like Izannah Walker. The head shape of this doll is a wonder! 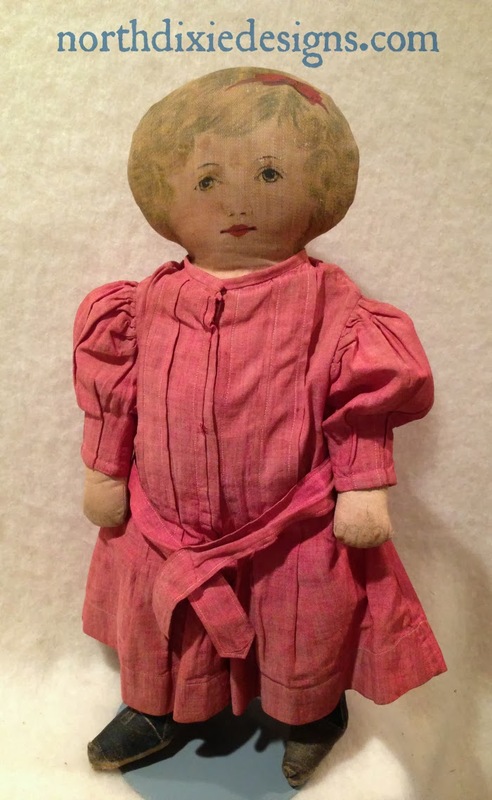 This doll is named Sethany Fairchild, and was made in 1986 by Helen. She wears a dress made of antique fabric, and has a lovely bonnet that comes with her. She wears antique shoes, pantaloons and a petticoat. There are a couple of pinholes in the back of the dress, and a tear in the top of the back of the chemise. The doll came to me in this present condition. You can see more images of this doll at this online album. 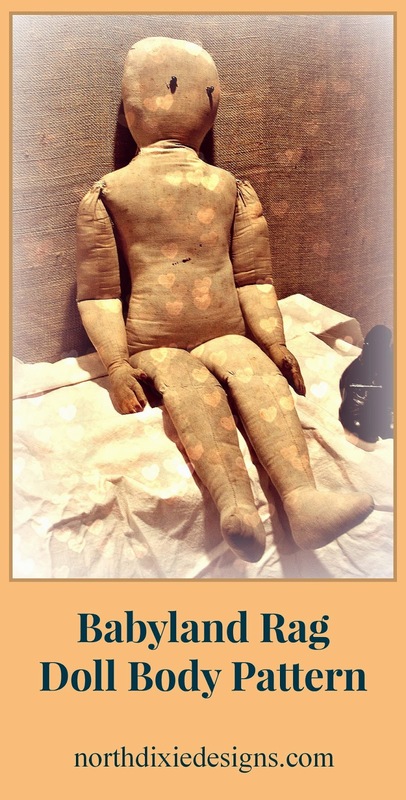 Please be sure to review all the pictures and ask any questions you have, as this doll is being sold as is with no returns. I do the best I can to describe items so that you are pleased. I offer finished creations to my Newsletter list first and then post on the world wide web. I started doing this when I stopped doing commissions. People wanted to know when I would have a finished creation available. This was the best way I could think of to notify interested buyers and not forget. I let the email list know first when a work is available. Then I list the doll in my shop the next day. This girl didn't make it to the shop, but sold to someone on my email list today. If you'd like to sign up for the email list, please add your information below. You can join or remove yourself from my email list any time. After you submit your name, you will receive an email to confirm that you want to sign up for my newsletter. Click on the confirm button and you will be added. New creations such as the one shown here are offered to my email list first. I respect privacy; your email address is required and is never shared. 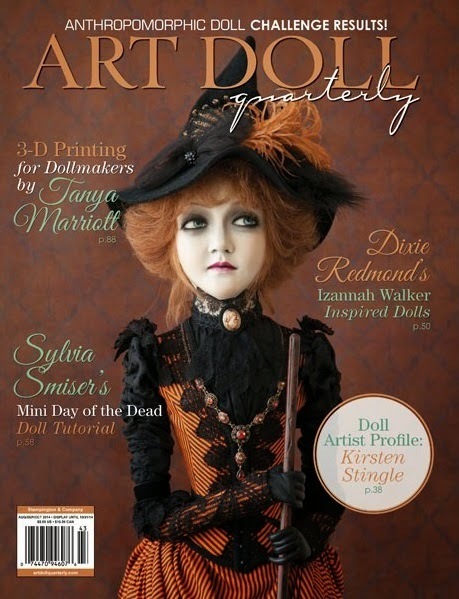 This Izannah Walker inspired doll is 18" tall. I started this folksy 18" tall Izannah Walker doll long ago, and used her to demonstrate adding stockinette to a doll in this video. 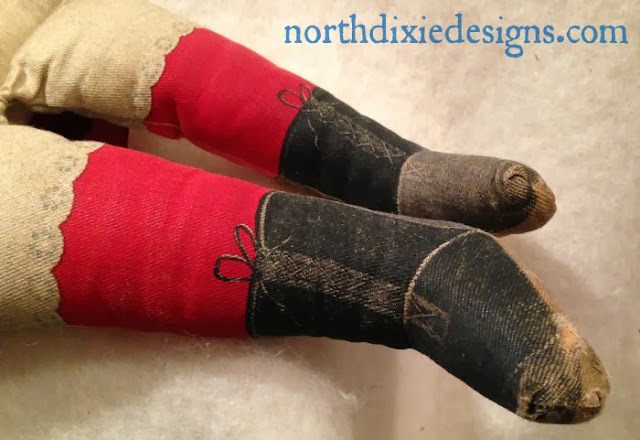 A doll making friend called my dolls "rare Dixie Redmond dolls", and so they are, especially the ones inspired by Izannah Walker because many, many hours go into their making. 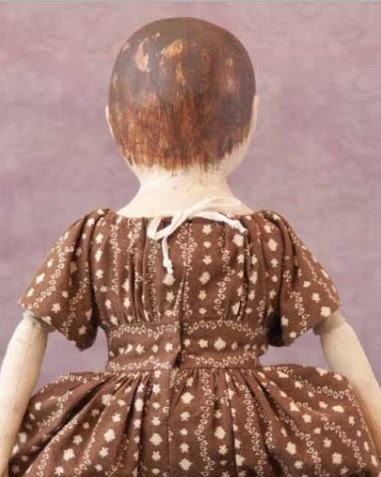 Sometimes it's because I repaint them several times, or as is the case with this doll, apply two layers of stockinette. 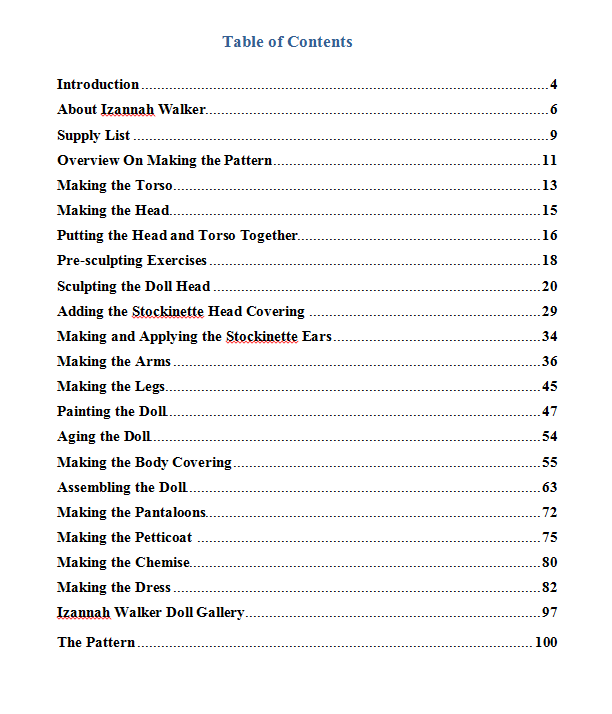 I've been studying Izannah Walker dolls for over 6 years intensively, documenting many Izannah Walker dolls in that time. 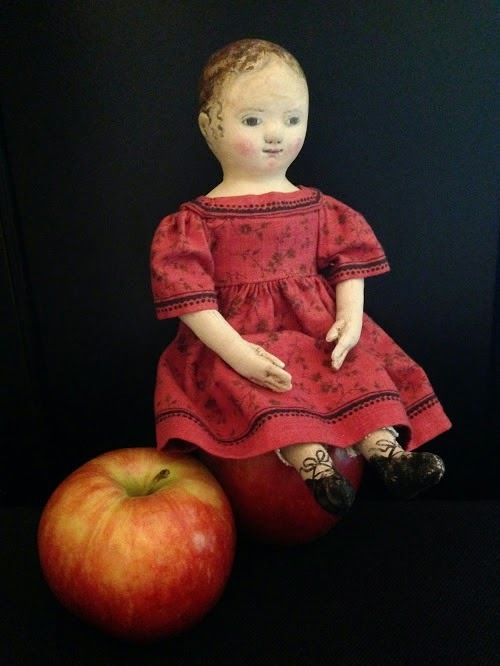 This doll is made using my patterns with paperclay sculpting over cloth. After the sculpting is finished, I carefully apply a cloth layer over the sculpted head and shoulders. With this doll I experimented with using cotton tubular ribbed cloth, which had a more prominent ribbing. She has cloth applied ears made of the same ribbed cloth that is applied to the face. She has a second body covering similar to Izannah Walker dolls. Her plaid gathered bodice dress is a classic Izannah style, layered with a printed apron which has been aged to soften its look. Her dress is open in the back, and connects at the waist and neckline using hook and eye closures. She wears pantaloons which match her dress and are finished with a shell stitch. She wears a printed reproduction calico petticoat. She holds a traveling companion, a china shoulderhead doll which I purchased at an antique auction. I purchased this doll on Ebay some years back. She is sweet as can be, measuring 10" in height from her head to toes. She is not perfect, however. There is some loss on the back of her shoulderplate, and there is loss on the hair area, which is painted with a rough matte paint, not shiny. I don't know if this is how she would have sold originally or if the hair has been repainted. She wears petticoat and pantaloons which are sewn onto her body. $75 includes shipping within U. S.
Here is a Small Greiner head which has been repainted by E.O.N. 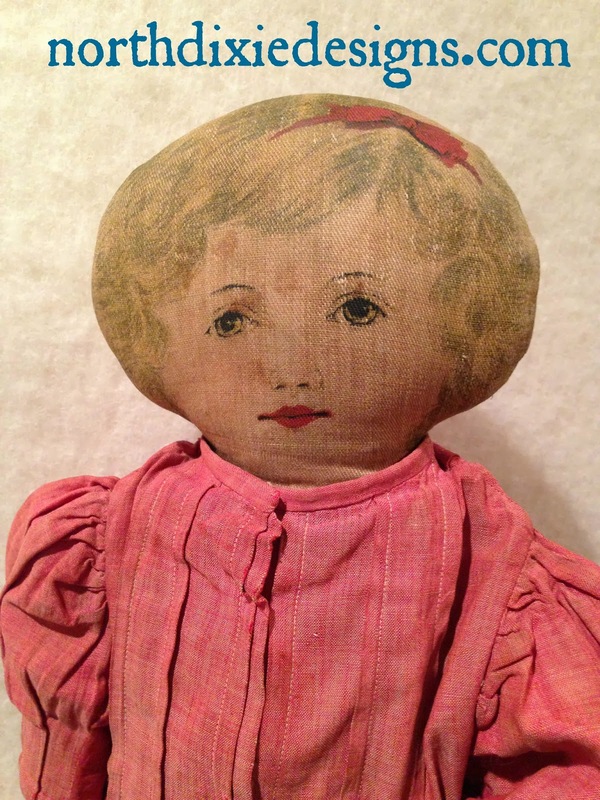 She is a lovely little shoulderhead, with the patent label showing on the back. She measures 4" wide and is 4 1/2" tall. Please look at all the pictures, as the ones of the interior show that repairs have been made at some point in her past. The pictures when clicked should enlarge. As any questions you may have. I purchased this doll in 2010 from Withington's (love them!). I have enjoyed her for a few years and now I am thinning my inspiration collection again. I will be listing quite a few things this week, so be sure to check back. Please ask any questions you have after reading the description and viewing the images by emailing Dixie at northdixie@gmail.com. This doll is being sold as is, with no returns. 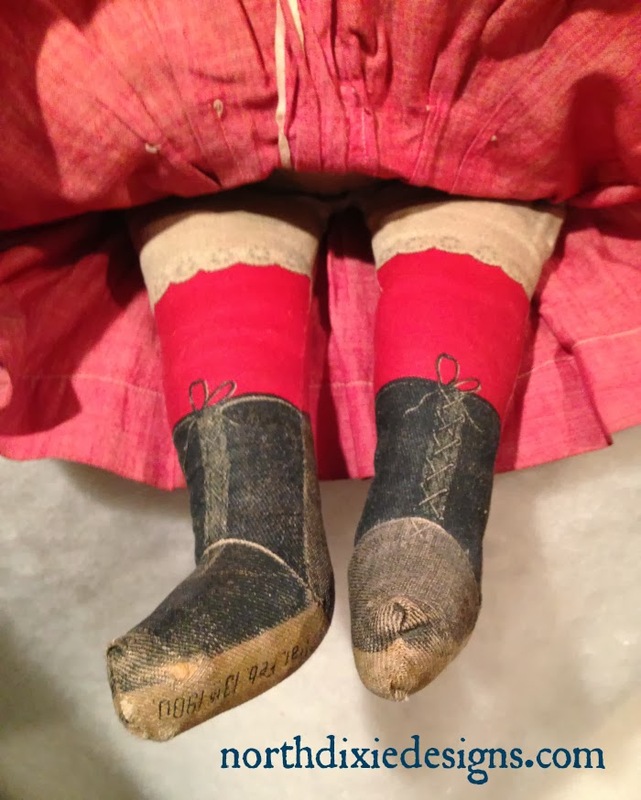 This doll is an Art Fabric Mills doll and is marked on the foot February 13th, 1900. 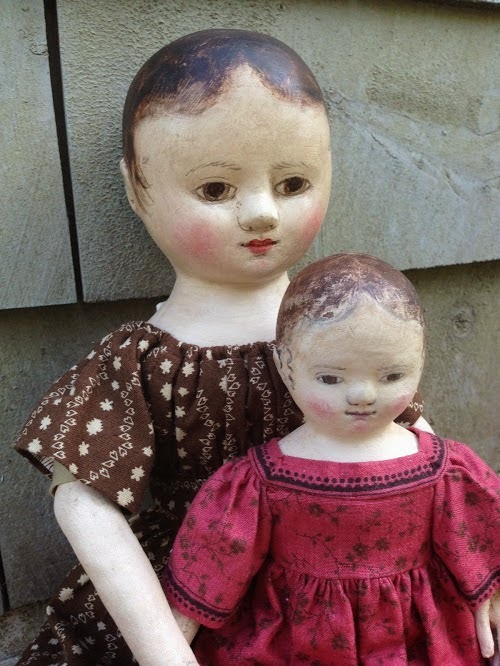 These dolls were originally made as printed on fabric for a home sewist to put together and dress. This dress is a lovely dress made for this doll although needs cleaning. I have not removed the dress before. 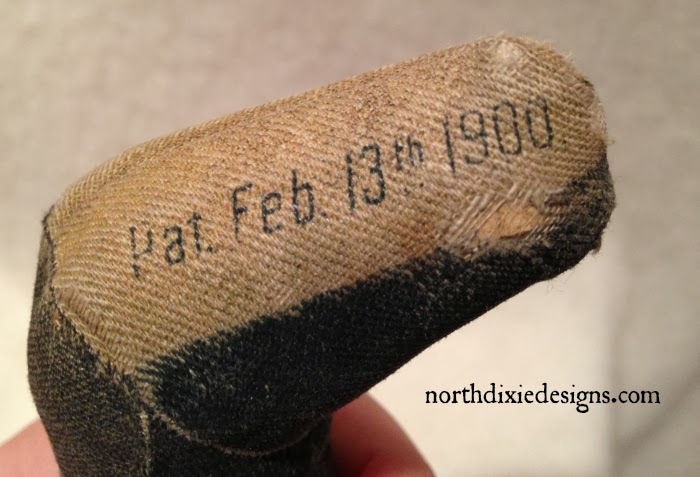 The doll has some wear in places, and some spotting, but she iis 114 years old, and I would have some wear and spots after that amount of time, too!